The Oscars are so yesterday. 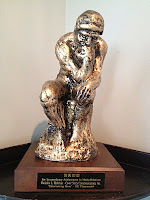 If you’re in the PR Biz and publicity is your game you want the coveted Golden Thinker, awarded by the North American Precis Syndicate Inc.(NAPS). Congratulations to Danielle Elderkin and Cover Story Communications, this year’s Golden Thinker winner for excellence in creative writing and press release placement results. If you’re in PR for any amount of time you know the NAPS game. You write a small story and NAPS ‘places’ it in small newspapers around the country. The big challenge is to write a story that is compelling and timely so more and bigger media will want to publish your story. It’s hard work and it takes creative thinking. The winning press release was written on behalf of Cover Story client Fiesta Dinnerware, the most collected china in the U.S. and best-selling line of The Homer Laughlin China Company. It was titled, “Nostalgia Makes A Comeback,” and offered ideas for creating a feeling of reminiscence while entertaining, or hosting a family gathering or dinner party. This theme was not only a popular, cultural entertaining trend at the time, but also fit nicely in to Fiesta Dinnerware’s initiatives. In 2011 the American-made dinnerware company celebrated 75 years of making its colorful, iconic dishes. Fiesta is also well-known as a popular collector’s item, passed down from generation to generation. The result? More than 1,100 placements over the course of the year. Publicity! The currency that is gold to a client. Connect with Cover Story Communications: Twitter @CoverStory; Facebook. “This article generated results that are well above and beyond what would typically be expected. The award is given to those that are the superstars in Public Relations and for the success that this project achieved, the recognition is well deserved,” said Dorothy York, President of NAPS.